Oh, how I love my days out with my daughter Bee and today was another great one despite our disappointment to find the ruins at Bishop’s Waltham Palace were not open. It was an important residence of the powerful Winchester bishops, the palace hosted many royal visitors including Henry V who prepared for the Battle of Agincourt which is kind of cool because Henry V is my favourite Shakespeare play! 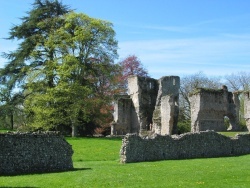 The Palace was destroyed in 1644 under Cromwell’s orders but the ruins today are absolutely breathtaking and we have enjoyed many a picnic in the grounds on a warm summer day. Though a winter walk was not possible, never mind because we really relished the opportunity to explore the charming medieval town. Well, we found the parking in the medieval town centre really cheap at 30p for an hour or better still £1.50 for a day! Bee and I loved exploring this lovely charming little town – we made some super finds and our nose kept drawing us to what looked like some fabulous eateries. However, we’d already decided that today lunch would be at the Alma which is a Crown Carvery five minutes drive away. Bee was particularly drawn to looking in Annabels which is on the High Street sadly they don’t have a website so we can’t share their gorgeous dresses with you! We also loved the lingerie shop just down the road from Annabels but both of us can’t remember its name so we can’t share that lovely find with you either – sorry about that, maybe I should rename this as the Crap Reviews by Mother & Daughter? We fell in love with Hawthorns Interiors but unfortunately everything we liked and picked up happened to be display only and not for sale which was such a shame! It was a delightful shop and we know there were items we hope to purchase when we visit again. It was a delightful little town and would be a good place to explore if you are visiting the area or going to Marwell Zoo. I know each year we take the kids to Bishop’s Waltham when its Christmas lights are on as it really looks beautiful. http://www.banksbarbistro.co.uk/ The smells wafting from this Bistro made Bee and I cross the road and look at the menu. We were so tempted but I have promised Bee that a visit is on our to do list. Lunchtime two courses and a glass of wine was just £15 which was pretty impressive. But today we wanted to retry the Alma, we’d been there a couple of weeks ago and though we’d been pretty impressed at the cost we were disappointed with the potatoes and beef. No such disappointment this time and we were so glad we gave it a second chance! The Alma is a Crown Carvery and is situated on the Winchester road just past Marwell Zoo – it has a spacious dining area, is comfortable and inviting with a warm welcoming atmosphere. It was already quite busy when we arrived at 12:05 pm but we found a table and paid for our two carveries and two medium Cokes for a fantastic £10.38. We chose a table by the window and put our drinks down as we then went to queue up at the carvery. There were quite a few older people queuing but as you look around you can see that the Alma appeals to young and old as well as families with young children and babies. There were several families dining with young babies in high chairs and it is obvious that the Alma is a place that welcomes families.It has a fabulous children’s play area in its garden which looks like lots of fun. Bee and I have said we think the three youngest in our family Alex aged 10, Katy who is 9 and Fred 7 would enjoy the experience of a carvery and we are definitely going to take them one afternoon when we pick them up from school as a treat; especially in the summer months so they can enjoy that play equipment! The three ladies in the queue behind us, did get quite vocal at one point when they thought today’s carver Emily was slicing the turkey to thin but I do think Emily must have heard them because my slices of meat were by no means thin – thanks ladies! I had all three meats on offer but Bee decided just to have the ham and beef. We both liked serving our own vegetables and were determined this time not to overfill our plates. I remembered but when I turned to look at Bee there was a mountain of potatoes and vegetables on her plate. Greedy guts! It did not disappoint – though both of us had tears running down our eyes – wow that mustard was a scorcher! I thought the beef was perfectly cooked unlike when we had visited the first time when it was like eating the sole of your shoe! I was so impressed with Bee as the only bit left on her plate was the bits with that fire-breathing mustard on! The friendly waitress Sue, took our plates and then tempted us with the delicious sounding toffee apple pie. Bee was absolutely sure she was stuffed but I thought there was just space for a bit of pie and ice cream! Bee decided she’d have a pot of tea. We had a very short wait before Sue appeared with the tea then my toffee apple pie with ice cream that cost just £3.18. Sue was absolutely right it was delicious and Bee was lying, she wasn’t stuffed because she nicked my pudding off me! We had a lovely time at the Alma and really think we’ll be eating there again soon. There is no need to book at Crown Carveries, just come along and find a table, then order what you fancy at the bar. For Christmas day however ALL tables must be prebooked – after all it is Christmas. Please be advised that the maximum table size is 12. However this cannot be guaranteed due to the different restaurant configurations. On the main Winchester Road just passed Marwell Zoo leading to Bishops Waltham. Definitely sounds like a place to put on the to do list when I’m in that neck of the woods. The carvery sounded very tempting!! Sounds like a great day out and lots of useful recommendations! I would like to try the carvery but it is a bit far for me to go for lunch! I know that my ravenous teenage sons enjoy piling their plates high at a carvery, so will try to visit in the school holidays.